Apart from direct donations, there are other ways that you can contribute to our work. Please support us every time you shop online. Narcolepsy UK has joined forces with Give as you Live to raise valued funding via our supporters' normal online shopping. With Give as you Live, thousands of brands including Amazon, Play.com, John Lewis and Expedia have signed up to donate to us a percentage of every purchase you make online. All you have to do is register and follow the instructions, all at no cost to you and at no cost to us. The average shopper will raise around £2.10 per month through what they already buy online. Please try Give as you Live today, and pass this message on to your family and friends, so that they can help us too, all without spending anything extra! If you are getting involved in a sponsored event, or even setting one up yourself, you can use the Virgin Money Giving website. On it you can create an individual web page for your sponsored event, enabling you to collect sponsors and funds online. You can also use it as a way to donate the proceeds of an offline sponsored event. Narcolepsy UK has a dedicated page on Virgin Money Giving where you can find out more: Click here to visit Narcolepsy UK on Virgin Money Giving. If your employer operates a Payroll Giving scheme, please use it to support us. If they don't, please ask them to consider setting up a scheme. Research shows that companies which offer Payroll Giving believe it improves the company image, enhances community involvement programmes, and supports employee volunteering. By leaving a gift to Narcolepsy UK, you can help us to be there for people suffering with the effects of narcolepsy, long into the future. It's easier than you think, and means we will be able to help even more people suffering from this debilitating life-long condition. We are now able to provide discreet donation envelopes which also collect gift aid thus increasing relevant donations by 25% at no cost to the donor. These envelopes could be suitable for a variety of occasions (weddings, birthdays etc). Please contact us if you would like some. Please collect and donate your used stamps to help Narcolepsy UK raise much needed funds. All you need to do is collect them all, request a FREEPOST label and pop them in the post. It is that easy. Every donation we receive is vital to help us continue to help support people with narcolepsy, their families, carers and others interested in improving their quality of life. The charity is self-supporting, we seldom receive any government grants, making the charity all the more reliant on the community spirit of fundraising. Why not ask your family and friends to collect as many donations as they can? Maybe your children can also get involved at school, having their friends and teachers bring in envelopes for them to donate. Every donation we receive with a return address on it, will receive confirmation of receipt. We do hope that you will help us raise as many stamp donations as possible. Please send your stamp donations to: Xchange Master Ltd, 272 Bath Street, Glasgow G2 4JR. To receive a FREEPOST LABEL, call 01413 289357 or email narcolepsyuk@xchange-master.co.uk. We are now able to accept donations of foreign coins, and would be very grateful if you would choose to collect them for us. To do so, please request a collection pack by emailing info@narcolepsy.org.uk. You can help us by recycling your inkjet cartridges via Recycle4Charity to raise money for us and protect the environment at the same time. It’s so easy, just register here. 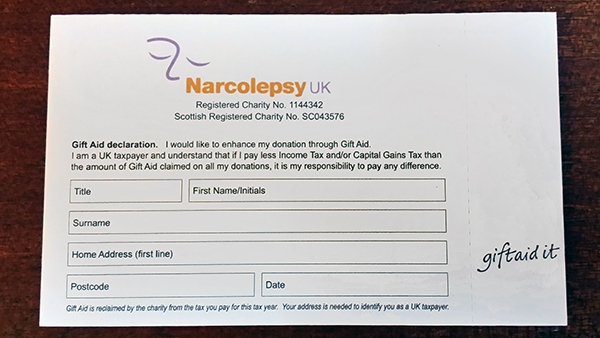 Narcolepsy UK should automatically be selected as the chosen charity, so just complete the registration with your basic personal details. You can order freepost bags to return your items in, and you can even monitor your account to see how much you’ve raised and each quarter an automatic payment will be made to the charity. Once you see how simple it is to raise money, please get your family and friends to join in and help support our work. The website Amazon has begun a programme of charity support. It's called Amazon Smile, and if you use it Amazon will donate 0.5% of the net purchase price (excluding VAT, returns and shipping fees) of eligible purchases to the charitable organisation of your choice. Same products, same prices, same service. Although the percentage donated is not as high as "Give As You Live" (see top of page), all support is welcome. If you use Amazon Smile we would be grateful if you chose Narcolepsy UK as your charity.